Well, since first pontificating on the issue of diversity in gaming and coming up with this idea to run an intro game for locals, two major things have gotten in the way. First recent events in this country have made discussing diversity a far more loaded topic than before. I’m not sure what if any spin this has on my own little idea, but it has made conversations just a bit trickier to navigate. Second, it appears that today the moon is going to block out the sun and this is a “very big deal”. At least Jenn tells me this is a very big deal to public librarians who are overloaded with requests for info, and she suggests maybe I wait for that event to be over before I pester my own local librarians about my little event more. OK, fine, but where does that leave my project? Basically in stasis right now, unless someone decides to respond to one of my emails. So I turn my attention to the things I can directly control – the content of the game. What would make a good game for someone totally new to the hobby? What is the best intro that’s both going to be easy enough to learn, but also hook new players into coming back again? I’ve seen a lot of folks recently lean on module B2: Keep on the Borderlands for this kind of thing. It seems pretty popular at conventions anyway. 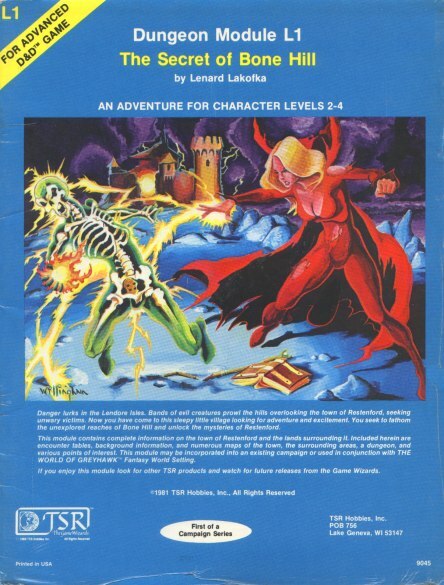 I re-read it myself recently and it has a lot of great elements – a town with lots of interesting NPCs to interact with, a few wilderness encounters on the way to the dungeon, and then finally some fun caves chock full of monsters. That said, it’s a bit long for a single session. Trying to edit it correctly feels challenging, and the fact that it’s just a bit overplayed makes me want to shy away from this one. When I first started playing my current campaign I started with L1: The Secret of Bone Hill. 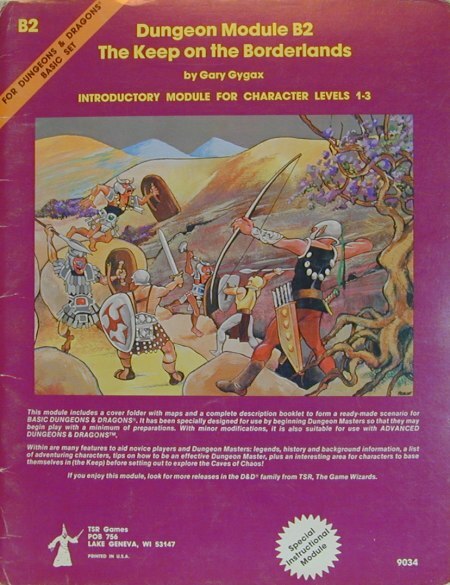 This is also a great sandbox module – interesting NPCs in the starting location, plus a lot of wilderness to explore that is riddled with fun smaller dungeons. That said I feel this is a bit too open ended for complete newbs. It does include one real starter dungeon right in town, but I think that one is a bit too cliche with its intro of giant rats in the basement. Awesome module for kicking off a new campaign, but again not quite what I’m looking for. 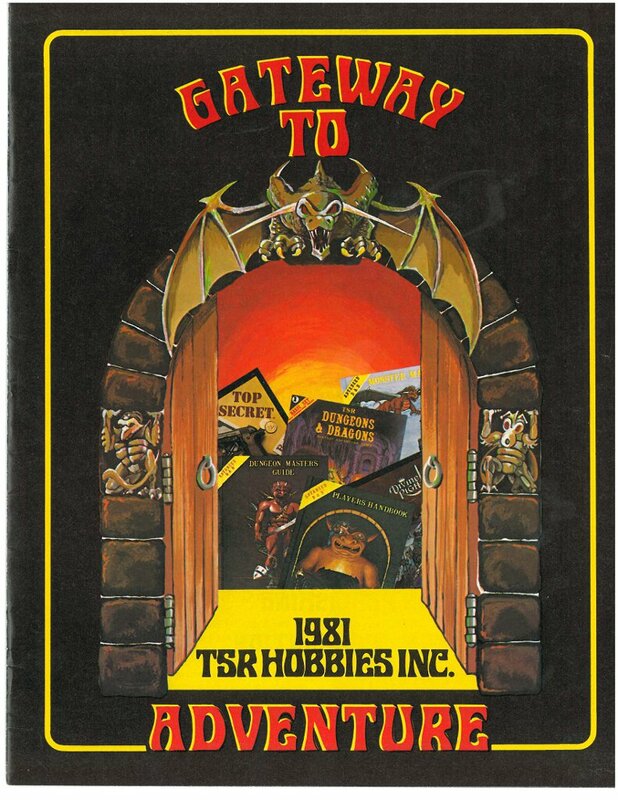 Another personal favorite is The Keep at Koralgesh, originally printed in Dungeon Magazine #2. The intro location is very much abbreviated (a tavern, one NPC with a hook to the adventure, and a table of rumors), but the dungeon itself is full of good stuff. There are a few cliches in it (one NPC goblin that is clearly a Gollum rip-off stands out), but generally they’re pretty easy to rip out. Again this dungeon is probably way too big for a one-shot, so I’d have to find a way to give the players a good goal in the early levels that’s easy to hit to encourage them to get out without seeing the whole thing. I think I can do that pretty easily, so this one is I think my strongest contender right now. Finally, there’s the question of character creation. I often rail against one-shot or convention games that include character creation. It’s too slow, it’s not the most fun part, etc. That said, I think to really properly introduce new players they should be exposed to some part at least of character creation. It’s a big part of the game, and I think providing the players with that personal investment in the character up front will really help hook them. But how to do it very quickly? One thought I had was to try and stream-line it down to little more than stat rolling. I’m thinking of things like Dan’s randomly generated spell-books he provided for magic-users in my recent birthday game, and BJ’s “equipment pack” cards. If the player rolls stats, picks race and class, and then draws a couple cards for random equipment etc, that might get it done quickly enough that it won’t eat into too much game time. It seems at least worth an experiment. Hmm, maybe I should set up a practice run of this game before unleashing it on the public. Perhaps I could run it here at work, and put out a call for folks who have never played or not played in a very long time. I wonder if there are enough people in this office that actually fall into that category? At origins I was at a Call of Cthulhu game that included character creation. Initially, I rolled my eyes, thinking ‘uh oh, this is going to take forever’, but somehow the GM managed to get it done very quickly. 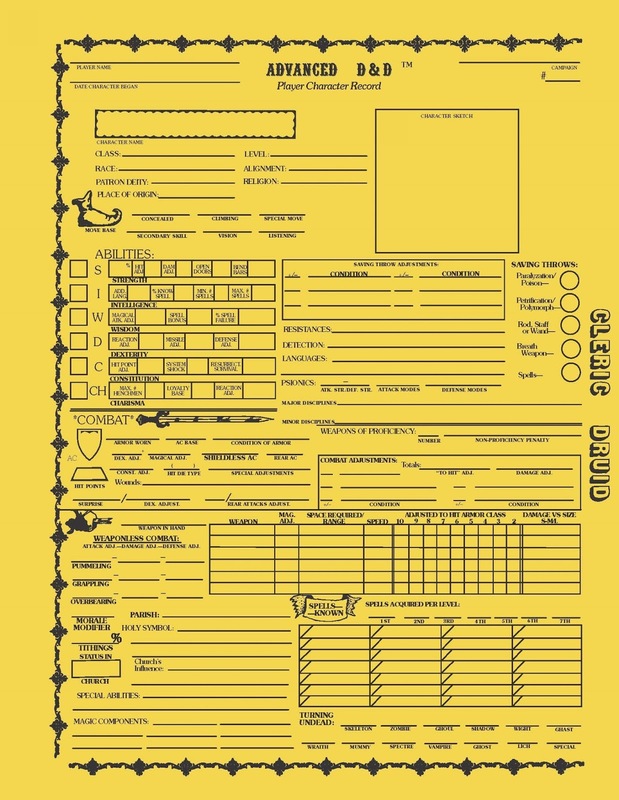 I have played in a con game where the character sheets were filled in as we went along. The DM made the sheet kind of like a menu. Pick one from column a then pick from column b. The players just drew a circle around what they wanted. The stats were rolled as needed. I don’t know that it worked well but it was a different approach than rolling characters the normal way. One thing I’ve learned is that absolutely none of the classic adventures are completable in a 4-hour slot or anything close to that. (*) I don’t know if you agree with the tournament rule-of-thumb that you get to about 7 encounters, but I do think that’s close to my experience. Excepting maybe module O1, which has timed scenarios designed for 1-hour slots, and I like a lot, but those are both solo and high level (8th level thief). Perhaps a one-page dungeon that you like a lot would fit the bill. There’s one called “The Scepter of Yolacha” by David Dudka that I prepped in expectation of a newbie game like this (never ran it though). Ping me if you want me to forward that. I really appreciate what you’re trying to accomplish here. I’ve always had a soft spot for N2, The Forest Oracle, as a starter adventure. It may not be sandboxy enough for your purposes. Neither N2 nor N5 likely addresses the issue of wrapping up inside of a single session. One retroclone that bills itself as doing just that is Beyond the Wall. It has, to my mind, a pretty nifty approach to chargen – though most definitely at odds with the limited-starting-PC-background school of thought – that helps determine the structure of the adventure. It has the usual set of retroclone rules peculiarities, but if you don’t want to adopt all that I’d think you could still port over the rapid chargen and leave the rest largely behind. I haven’t had a chance to play – only recently finished a read-through of every scrap of material published for the line, and am now in that craving-more phase. Tone/atmosphere-wise, it’s the closest I’ve seen to what I always wanted D&D to be – not sure how widespread that taste might be amongst your newcomer pool, though. I know I’m late to the party, but what about U1? I may be mis-remembering, but the first part would probably be well-suited to a short intro game. You know I’ve heard a lot of people really rave about U1, and I own it, but I’ve never read through it fully. I’ve tried a couple times and it just hasn’t caught me for whatever reason. Maybe I need someone to run it for me so I can see what’s so great about it.